On the other hand, Venezuela’s president, Nicolas Maduro, who was a bus driver before moving into former President Hugo Chavez’ government, refined his skills as a politician, not an economist, taking over when Chavez died in 2013. As a politician with a socialist worldview, Maduro continued with Chavez’ policies of inflating the country’s currency to pay for its welfare state. In the last 12 months, Venezuela’s money supply has increased by 127 percent, and the country is now reaping the whirlwind sown. That whirlwind is also called hyperinflation, the moment in time when those possessing currency finally realize that it is becoming worthless and try to exchange it for anything else that might better retain its value. Maduro has shut down the government’s reporting on the matter, and so thanks to the Internet and the ingenious efforts of a Home Depot employee in central Alabama, Bloomberg has a better idea of the destruction of the currency than do most Venezuelans. Officially the exchange rate in Venezuela is 10 bolivars to the dollar. But with hyperinflation taking over, the rate is likely to accelerate, reaching 3,500 to 4,000 bolivars to the dollar shortly, according to Asdrubal Oliveros, director of Edoanalitica, an economic forecaster in Caracas. The experience of Zimbabwe in the early 2000s is eerily similar, and instructive. A country also run by a Marxist, Robert Mugabe, Zimbabwe’s economic problems began with the expropriation of farms from their owners, taken from whites by the government to give to individuals unskilled in the farming. From 1999 to 2009, food and tobacco production was cut in half, while the manufacturing sector was devastated, dropping by 75 percent. The drops in farm and manufacturing production resulted in unemployment rising to 80 percent, which cut government’s revenues by a similar amount. Rather than give up his failing socialist experiment, Mugabe doubled down and began printing Zimbabwe dollars to cover the shortfalls. When prices started to rise, he instituted price controls and enforced them at the point of a gun. This led inevitably to shortages, forcing the hapless citizens to revert to barter for life’s essentials. The monetary printing continued, and the resulting price inflation became legendary. In the early ’90s, it was running in double digits, varying between 20 and 40 percent annually. But then, in 2004, a “tipping point” was reached, with inflation jumping suddenly to 132 percent, 585 percent the next year, 1,281 percent in 2006, 66,212 percent in 2007, and off the charts in 2008. In a single month, June 2008, the inflation rate hit 11.2 million percent, and by November the Zimbabwe dollar was totally worthless. These numbers came not from the government, which had stopped reporting on the inflation (just like Maduro’s government), but from an outside source called OMIR — Old Mutual Implied Rate — which was derived from the daily exchange rate between the Zimbabwe dollar and the British pound in which Old Mutual Insurance Company’s shares were traded. During that unhappy time, prices were adjusted daily, and then hourly, at restaurants and bus lines. Exchanges of Zimbabwe dollars for hard currencies were prohibited by Mugabe’s government, so transactions had to take place in back rooms, parking lots, and in the backs of buses and taxis. And that is the future of the “strong bolivar” for Venezuelans. 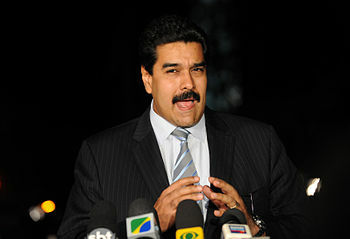 Maduro will be forced to print new currency in larger and larger denominations. The end is called a “crackup boom”: Citizens become suddenly aware of the fact that inflation is a deliberate policy and will go on endlessly. A breakdown occurs. The crack-up boom appears. Everybody is anxious to swap his money against real goods, no matter whether he needs the goods or not. Within a very short time, within a few weeks or even days, the currency used as money is no longer used as media of exchange. It becomes scrap paper. This happened with the Continental currency in America in 1781, with the French mandats territoriaux (banknotes issued by the French Directory in 1796 to replace the assignat, which had become worthless), and with the German mark in 1923. It happened in Zimbabwe (which lesson, interestingly, hasn’t been learned as Mugabe is back to printing new “bond notes” for its currency), and it’s happening in Venezuela as this is being written in late November 2016. This entry was posted	on Monday, November 28th, 2016 at 9:13 pm	and is filed under Economics, History. You can follow any responses to this entry through the RSS 2.0 feed. You can leave a response, or trackback from your own site.